There is an interesting phenomenon of human behavior which I have witnessed with a new sense of clarity since traveling to Bali. It is not unique to this part of the world. I saw it in Baja California Sur every time I went down there in past years. If I think back, it was probably evident when I vacationed in Poipu on the island of Kauai. Many other places in the world offer up a location which provides the safe haven for people to relax and be free of stress, for a short period of time. I suppose that is what a holiday is for. To recharge and regroup in order to go back to the salt mines with renewed vigor. A time to forget all your worries and slide into a different kind of life, if only for a mere 2 weeks. When a person is on holiday, all troubles fall away. You are able to transform into a person who is remarkably more calm and serene than the one who rages at fellow drivers during the morning commute. The strange thing to witness, from my perspective is twofold. First, the often-outrageous behavior which people think is acceptable in an effort to get away from it all. Excessive living in the form of over eating, drinking too much alcohol and generally turning into a person nobody wants to be around. Second is the completely misguided notion that this kind of activity is going to change anything about life when the vacation is over. I know what this is about, because I have lived it. What started with such promise on the journey to a vacation, passed by at the speed of light. One day blending into the other until all you have left is the credit card statement to show how much it all cost. On top of it all, you often return home more tired than when you left. We all seem to think there is a bucket list for every trip which must have all the items ticked off, to prove we completed a respectable number of activities and saw the right sights. This kind of thing works when you are young, I think. Maybe life has not beat you down yet. Re-charging can be accomplished in a long weekend. You are good to go for months after that. As time goes on and the office starts to join you on vacation, the charm of it all seems lost. You are up late at night answering emails after dinner and drinks. You are wearing the stress like a second skin. Even if you manage to truly unplug from your work and deeply immerse yourself in vacation mode, something equally unpleasant can happen. You don’t want to go back to your normal life. This is when you start fantasizing about selling your house and moving to Mexico to start a surf shop, restaurant, beach bar or any number of other businesses which you are totally not qualified for. There is actually a name for the illness experienced by prospective home buyers in Mexico on vacation – Margarita mind. Smart realtors will tell you to go home and think about it for a few months. Which is about how long it takes for most people to recover. Otherwise, if they actually did manage to purchase something, they wake up to the feeling of making a horrible mistake, quintessential buyer’s remorse. My husband and I never got so sick that we fell victim to actually buying something on a whim. But, we dream about it a lot. At least we used to. Now, as we travel around the world, we know the signs of people who are whooping it up on vacation. We have been there. One of the benefits of long-term travel is you are living a life you don’t need a vacation from. There are many ways to have this illusive kind of lifestyle, travel just happens to be one of them. We are giving much thought as time passes, to the design of our life once we return to Canada. For once you have become free of the 95% stress, 5% relaxation cycle, you never want to go back. At that point which you realize the fate you have avoided, as evidenced by many foreigners you see, there is an imperative to steer clear of that kind of life. There is also a renewed sense of purpose towards creating a life of purpose which can sustain you for the long-term. I have no misconceptions of the magnitude of money I am going to make. I think my biggest earning years were in the corporate world, and those days are behind me. Instead I want to do something which I will enjoy for the whole of my life, not something which I am counting down the days to the weekend, the vacation or retirement. It might sound crazy, but there are others out there who have claimed to have found this sweet spot. In fact, the Japanese have a term for this something called ikigai. This is the intersection of 4 four things. A small space in the middle of it all. It takes years for some lucky people to find this. For I don’t believe we are taught to think of our lives this way. We are encouraged to get an education which prepares us for a job which we can make a decent living at. While this is not a terrible idea, how does this prepare you to enjoy your whole life? I’m on a thought quest for the answers to these questions which intersect with each other. 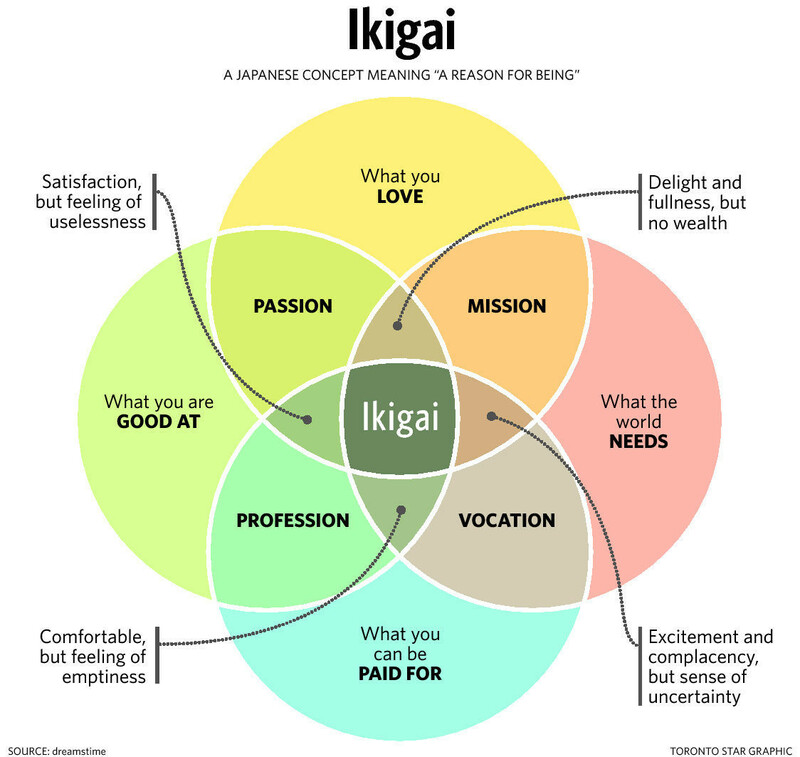 How do they overlap in such a way as to define what my ikigai is? Over the last few years I have completed a variety of similar exercises. Each one is trying to help you understand what your passion is and then advising you to follow it at all costs. I think that is a terrible idea. In the ikigai venn diagram, passion is but one facet to be considered in the pursuit of discovering, ‘why you get up in the morning’. I’ve spent most of my life in between the areas of ‘comfortable, but feeling of emptiness’ and ‘satisfaction, but feeling of uselessness’. I’ve walked around the edges of the centre. Lately, I’m firmly in ‘delight and fullness, but no wealth’. For obvious reasons I can’t stay here forever. I’ll probably have to walk through ‘excitement and complacency, but sense of uncertainty’, before I can reach the prize. I think it is probably important to go through all these phases, particularly to gain a deep understanding of what the world needs. I don’t remember reading that question in any of my b-school textbooks. Maybe it is newly added material. I think it is more important than ever, to determine what the world needs. With so many technical, social, environmental and educational problems to be solved, it is high time we all turned our attention towards finding solutions. Maybe a twist on the Kennedy speech – ‘ask not what the world owes you, but what you can give the world’. The search continues for me. Sometimes I feel like the answers are just ‘there’, slightly beyond my grasp. I write down a flurry of ideas and the moments of certainty evaporate, drifting away on a breeze. I’ll get there. My most recent session was very fruitful, bringing me another step closer to knowing. Stay tuned! Tagged on: bucket list travel Japanese wisdom ikigai life you don't need a vacation from living for vacation margarita mind stress and relaxation Stress reduction sun vacation tropical vacation What am I good at? What can I be paid for? What do I love? What does the world need? why you get up in the morning? Domo arigato for this Christine !! !